An emblematic monument of India, the Taj Mahal is as much for its general beauty, its charm, as for the quality of execution of the decorations that adorn it. The Taj Mahal is in red sandstone covered with white marble, often in the form of large plates. 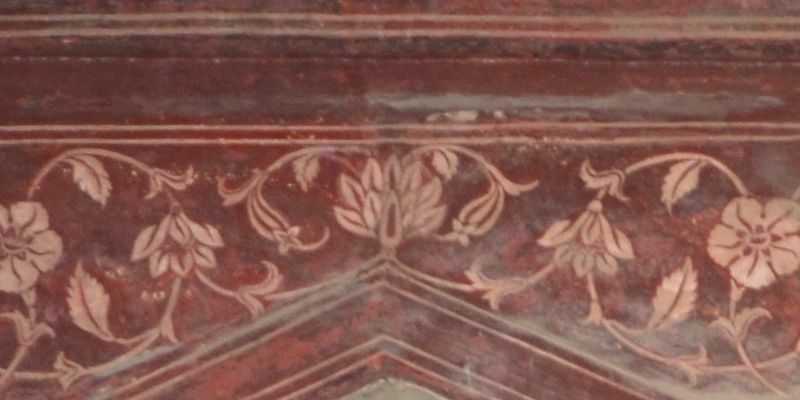 The bottom of most of the walls, both inside and on the facades, are covered with bas-relief with floral forms. Sometimes these are existing plants, sometimes not. 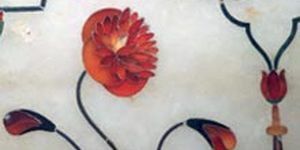 In the decorations there are also incrustations of precious or semi-precious stones according to the technique known as pietra dura. 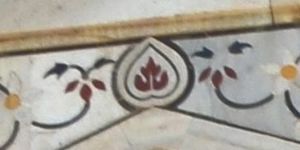 These inlays are either floral or calligraphic. In this second case, written texts are verses of the Koran. There are also sometimes paintings, but it is quite rare, as representation. 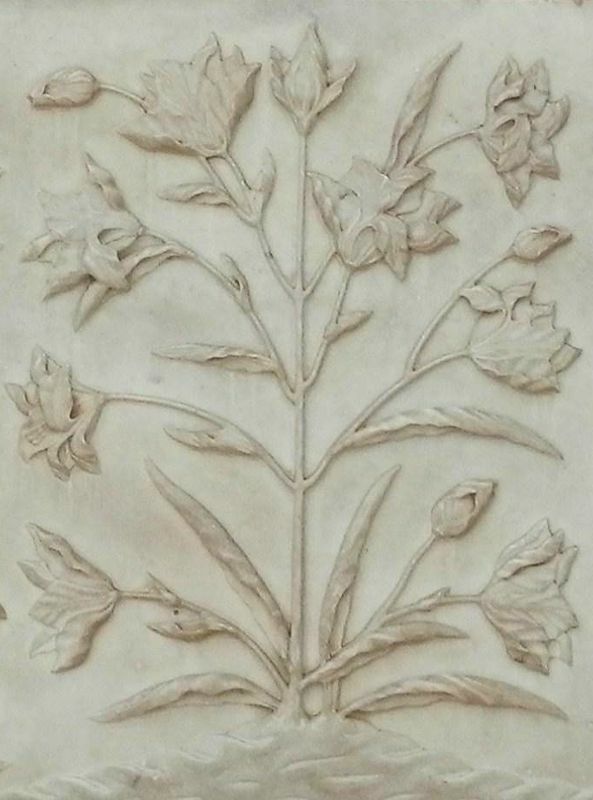 There is an impressive amount of plants represented on the Taj Mahal, it is the essential object of the decoration of the monument. The rest of this document is based on the conclusions of some studies by academics who have devoted theses on this subject. 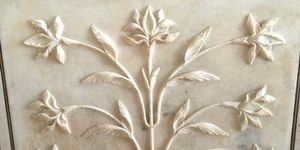 The iconography of the plants engraved in Taj Mahal stone is a treasure of architectural ornamentation, representing rich, delicate and exquisite samples of different species, carved mainly in the marble of the main mausoleum or in the red sandstone of the mosque. 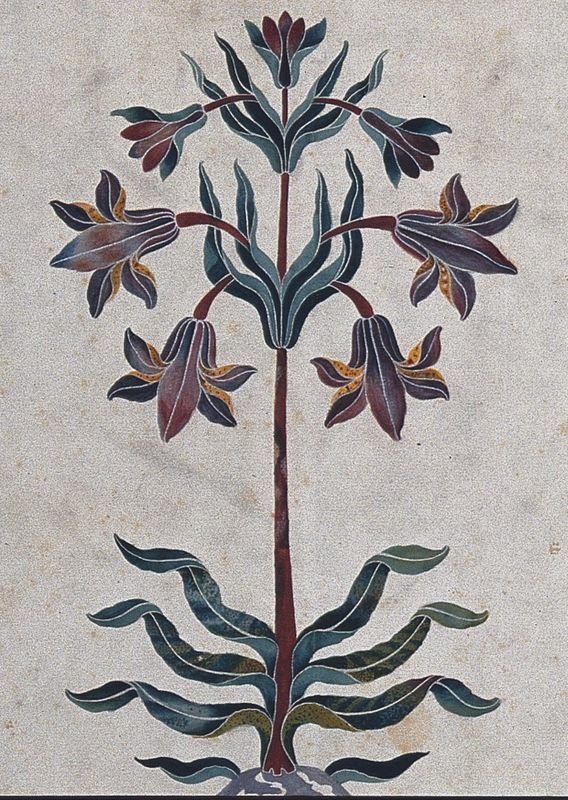 The other great representation of plants is the technique of Pietra Dura, a Florentine technique consisting of inlaid stones in a stone background. It is neither more nor less than lapidary marquetry, which requires a great technique. Here, the stones used for inlays are precious and semi-precious stones. But the most precious thing about this iconography is not the richness of the work, nor the artistic devotion that the authors found there, but in the information they contain. Indeed, the simple representation is only artistic, whereas the authors of decorations, in the seventeenth century, insisted on their meanings. 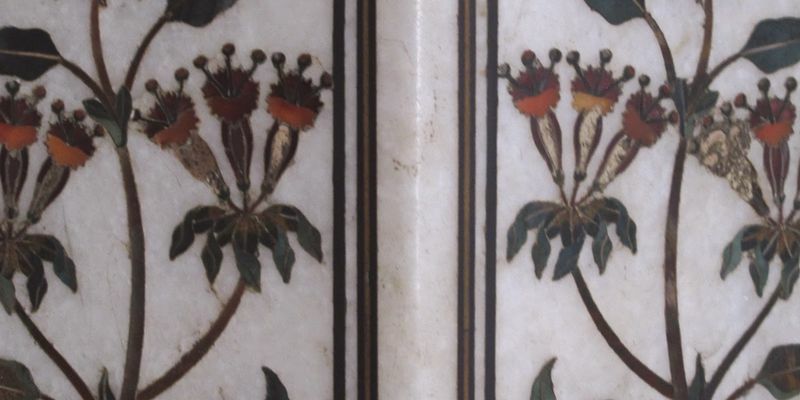 There is an exceptional richness of forms and number of plant species represented on Taj Mahal. 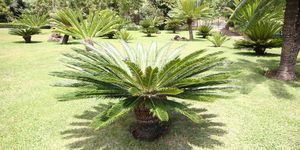 It is one of those characteristics, as Mr Wilson says in a 2011 study, which compared the plant's motifs with those in northwestern India, at least a great diversity in the architectural ornamentations. In addition, Gupta (1996) has documented the taxonomic distribution of 74 plant species used in the iconography of many Buddhist, Hindu and Jainist temples in India, while only 46 species are found here in the Taj Mahal. But 46 is already more than half, and for a single monument, it's a lot. Despite the wide range of research about their culture and history, India continues to bring new knowledge and new research opportunities. 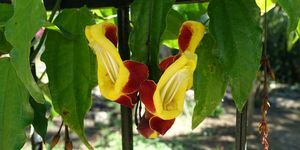 Thus, the more complete qualitative and quantitative analysis of plants on all old and recent Indian buildings has become necessary, and that is what greatly enriched the botanical knowledge of this country. 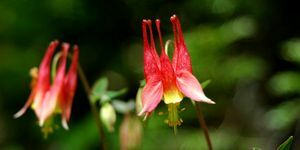 In addition, these studies document, to a large extent, the degree of cultural appropriation of plant resources and their taxonomic distribution by different Indian peoples, depending on their habitats. It is unfortunate to see the state of conservation of certain parts of the Taj Mahal, where the deterioration is obvious, whether because of the passage of time or that of unscrupulous visitors. 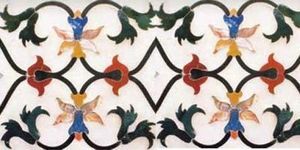 There have been flights, which is obvious, the gems were torn off the "pietra dura". These flights were initiated by English settlers of the nineteenth century and largely continued thereafter. 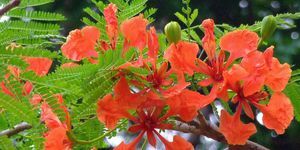 Despite the great floristic diversity of India (Venu, 1998), the country does not have enough taxonomists (Raj, 2010, Ali and Choudhary, 2011). 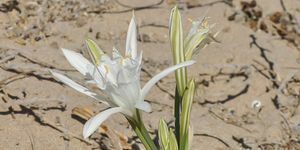 Probably because of this, the study and analysis of the many plants of iconography with their respective taxonomic assignments, across the country, is a task that remains undeveloped. In this sense, this work is beginning to fill the gaps in Asian plants, since of all the limited research on this subject, most of them have focused on European and American iconography (Pavord, 2005). ). However, Asian iconography is much older and perhaps more numerous, so it is appropriate to focus on the subject of our day. 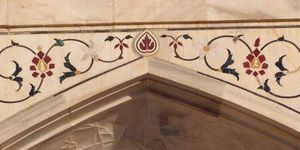 There are many studies on the iconography of the Taj Mahal, almost every year at least one academic in the World travels to the Taj Mahal to study the representations therein. The oldest modern study dates from 1961, but since 1983, here is an example of the different studies that have been devoted to it, just to get an idea. And again, this list is far from exhaustive. The rest of this page can sometimes refer to it. The latest studies show that there are 23 varieties of plants on the monument, which is a little more than what was said in previous studies. 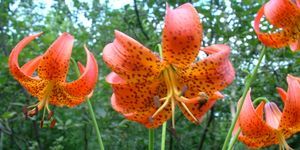 But still an even more recent study gives a much larger result of 46 different species, which is considerable, representing 42 genera and 29 families; Of these, the Liliaceae family has six taxonomic assignments (taxonomy is the science of describing living organisms and grouping them together), followed by Asteraceae and Buttercup, with four species each. 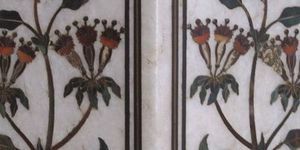 Thus, the number of taxonomic associations of plants represented in the Taj Mahal iconography is significantly higher (46 species). 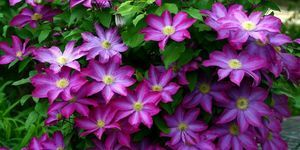 To use the definition, gimnosperms form a division of plants that are part of a paraphyletic subphylum of Spermaphytes that includes plants whose ovum is bare and is carried by leaf pieces grouped on a fertile branch. There are Nordmann spruce, cypress, pine, and so on. 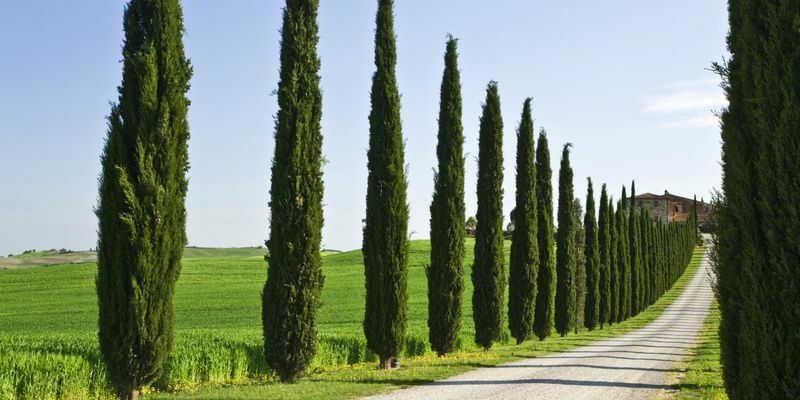 Cypress is a Mediterranean plant that has been imported to India for its physical representation. 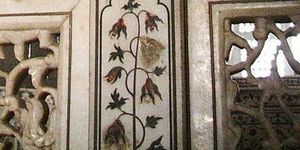 It is found many times in the niches of the mosque, on the side walls, alternating with other plants. 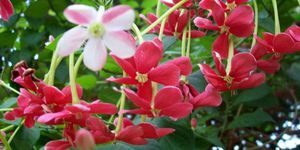 They are always surrounded by another plant, a kind of ivy named "Burma Creeper". The sago are small palms easily identifiable, in contrast to some species of flowers that are very similar. 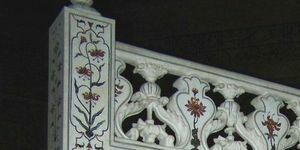 There is no example here of sago but this plant is present several times in the form of tuberous stems, at the base of several floral panels of the mosque. 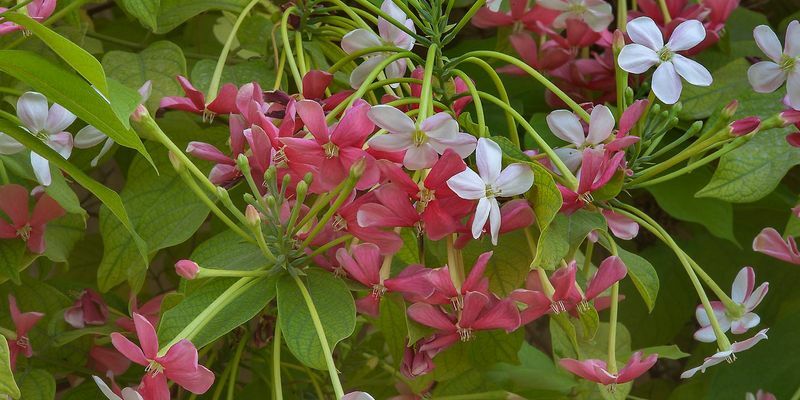 Each sago stem has three flowering branches with indeterminate Eudicotyledon leaves, each with several flowers. 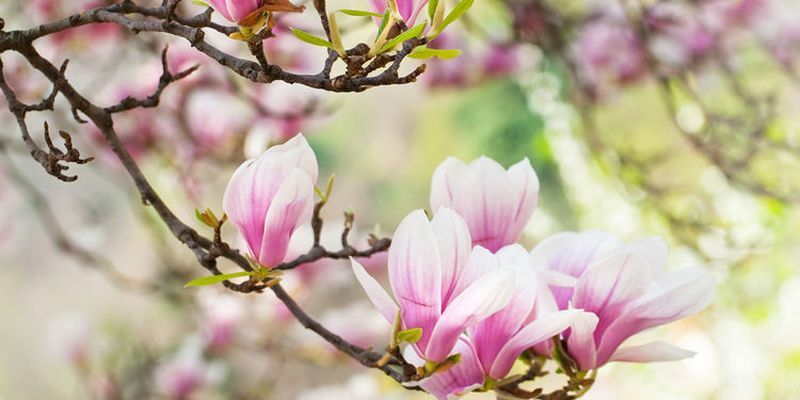 The division of Angiosperms or Magnoliophytes includes flowering plants, and therefore plants that bear fruit. Angiosperm means "seed in a container" in Greek as opposed to gymnosperms, above. 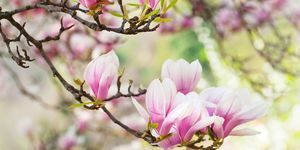 Magnolia is a common plant of our European region, but it also exists natively in India. 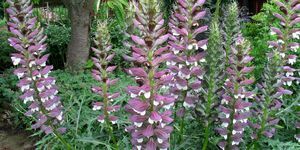 However its presence in the seventeenth century is not perfectly safe, which is why it can not be said that it is a local plant at the time of its engraving. She is depicted several times in the marble of the mausoleum. 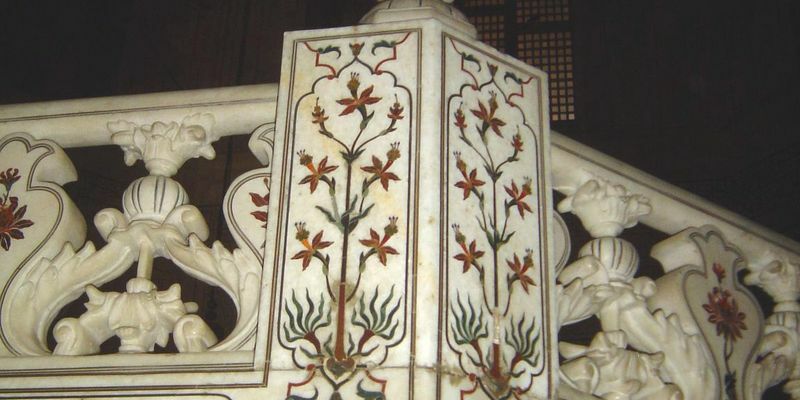 The orchid is present in different forms on the mausoleum of the Taj Mahal as well as on the mosque. Here it is the angelic form. 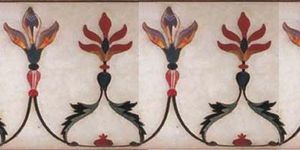 This representation is in pietra dura alternating with the river anemone. 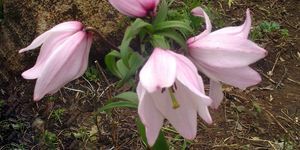 The orchid has petals mounted on a tulip body while the anemone has 5 petals. The anemone also has several roots. Ceylon Lily is a rather tall and fine local plant. 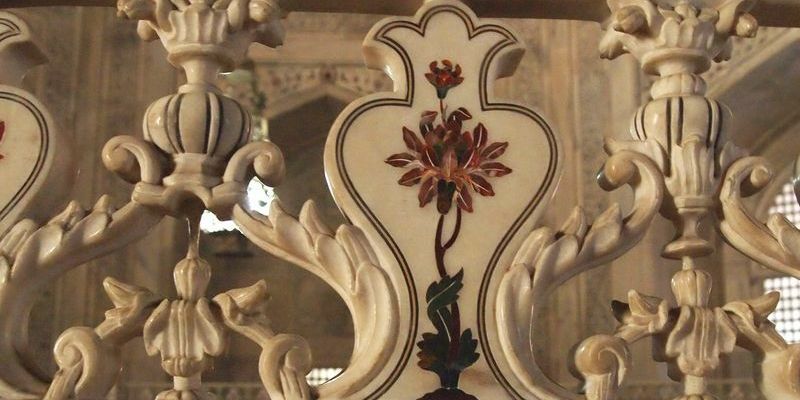 She has a stylized representation when she is made of pietra dura but her style is closer to reality when she was engraved on the red sandstone of the mosque. In the photo, it is, of course, the pietra dura. The Ceylon Lily is an endemic species of India, even in the 17th century. 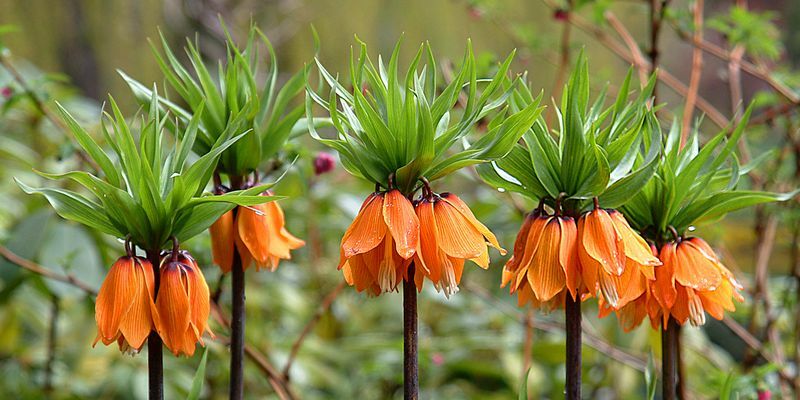 The Imperial fritillary is a very pretty flower whose originality is to push down, the upper part developing leaves. It is native to parts of western India, from Kashmir to Turkey, and was probably chosen for its beauty. 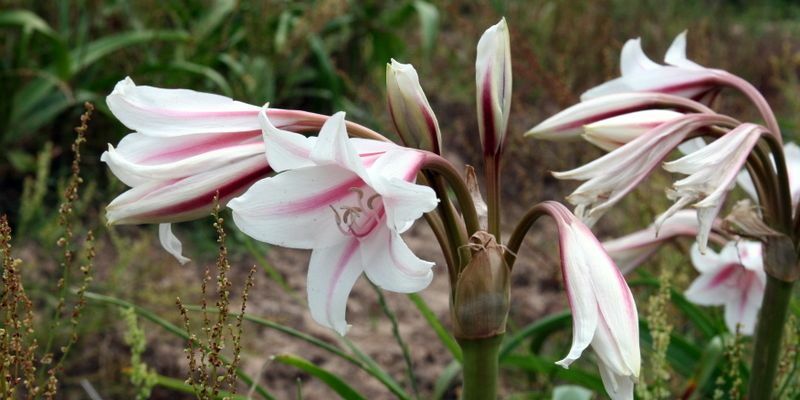 The glorious lily is a variety of flowers known for its fine and tormented petals. 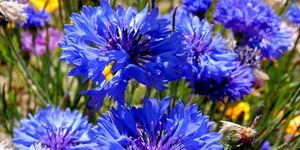 They are not, unlike other flowers, rather flat but shredded. 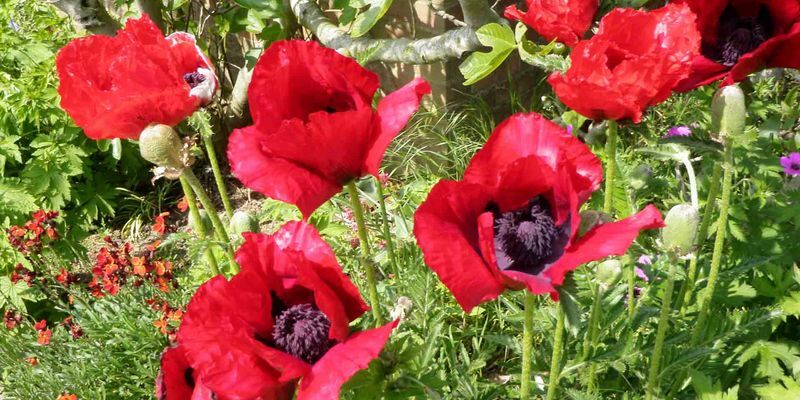 In addition their spacings make a very original flowers. 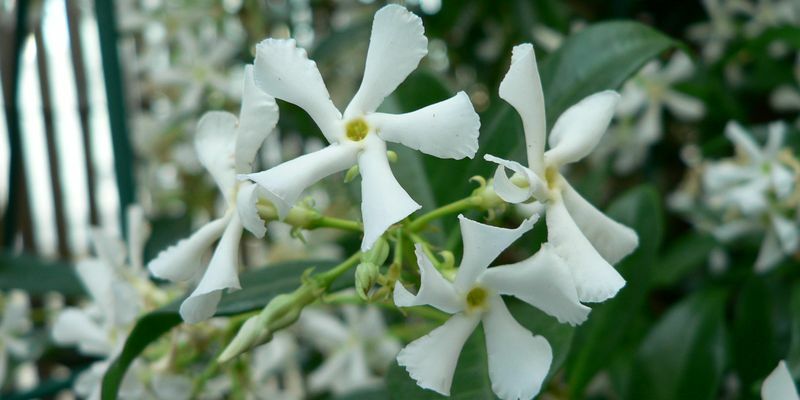 It has been introduced in India, it is not an endemic flower. It is on the Taj Mahal in the form of stone incrustations and as high relief engraving, as in the main mausoleum. 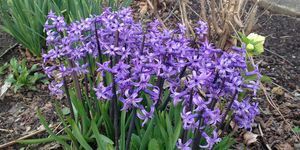 The hyacinth has a small resemblance with the orchid, in smaller. 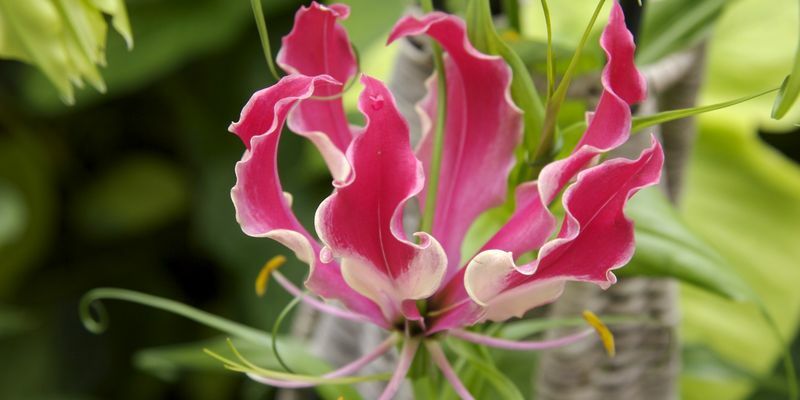 Its very curved petals make it an original flower. 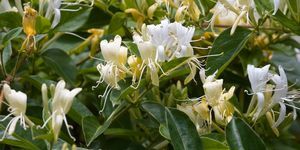 It is represented on the Taj Mahal for its beauty, but you must know that it is a plant imported from the Middle East, it is not native to India. 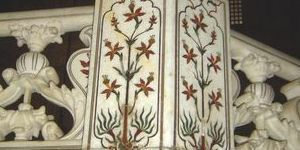 Several flowers and their respective leaves are found at the bottom of various floral panels of the mosque, on the sides of each tuberous sago stem. The iris is a plant whose flower looks a bit like orchid. She's big enough. It has been engraved several times in high relief on the marble of the mausoleum and on the red sandstone of the mosque. Point a little original, it is a plant that is represented in its totality, not in the form of a simple flower. In addition, as the panels that have it are inside the mausoleum, they have been protected from bad weather and are, even today, perfectly preserved. 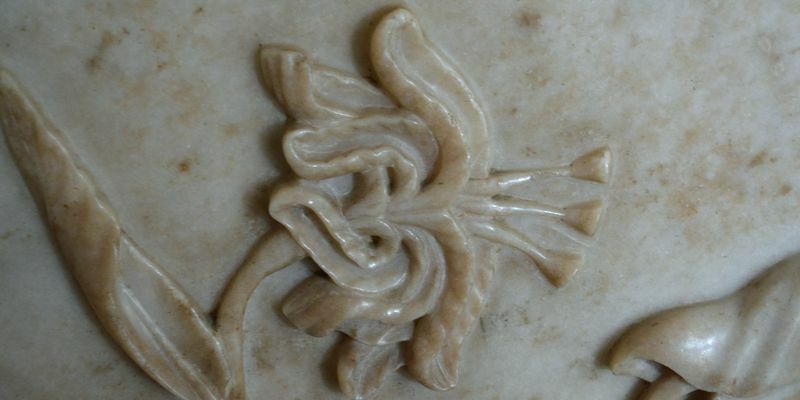 Called Siroi Lily, this little bell flower is represented a multitude of times in many places of the Taj Mahal. One of the places where we meet most often is in the main hall of the mausoleum, on the railing surrounding the cenotaphs. At regular intervals there are chrysanthemums, but these are surrounded by Siroi Lily. 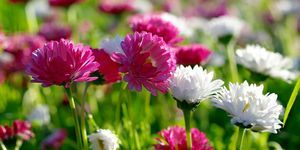 However we see them badly because the eyes are systematically attracted on the chrysanthemums, more central on the decoration. They are pietra dura here. This flower of the family Liliaceae is represented in the mosque, above the ogival passages, inside, as well as in pietra dura in the mausoleum. There she is on the poles holding the balustrade of the main hall, in sorts of cartridges reminiscent of the writings of ancient Egypt. This plant is not endemic, it was imported from Asia Minor as well as from Mongolia. 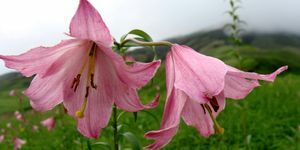 It is another flower of the Familly of Liliaceae, whose origin seems to be Local. 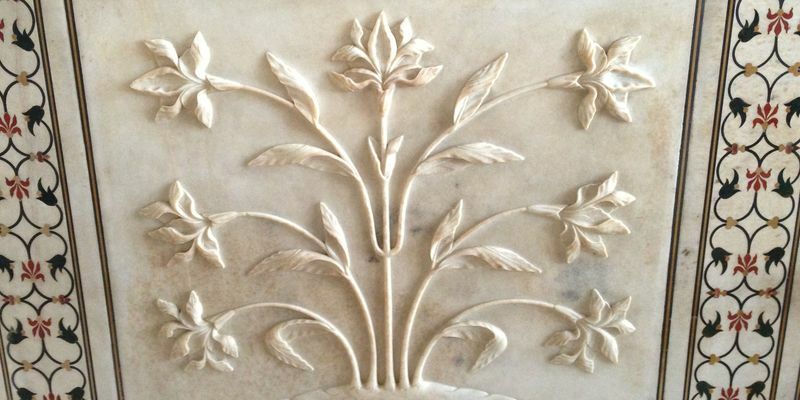 It is engraved as much in the marble of the mausoleum in the form of a complete plant. This representation is realistic. 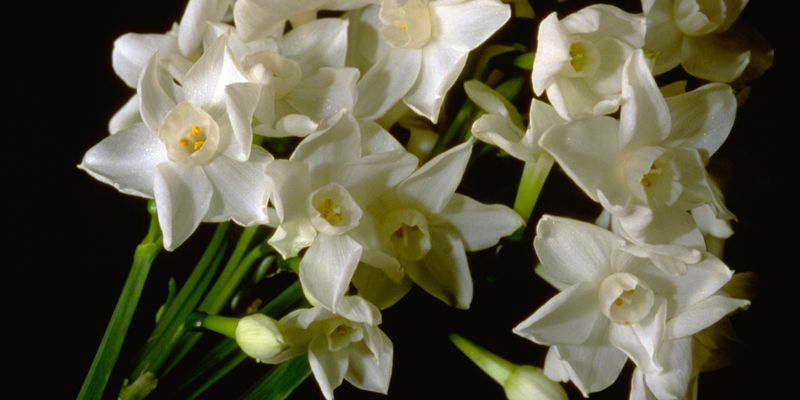 Narcissus is a common plant in Europe, but it seems to be the same for northern India in the 17th century. She is represented several times at the Taj Mahal, in the mausoleum (in pietra dura or engraved) and in the red sandstone of the mosque. 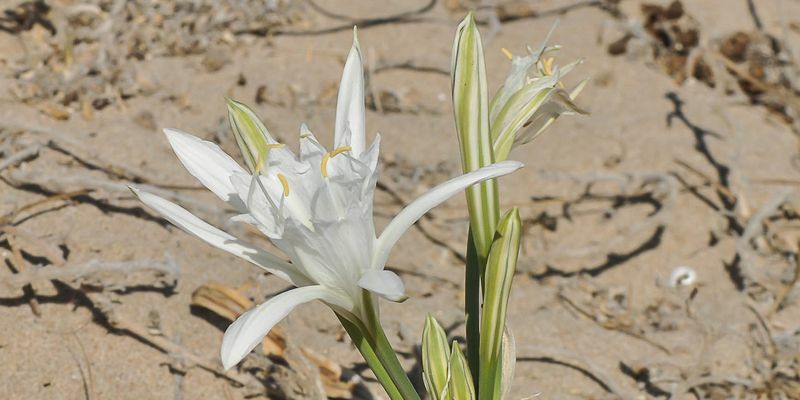 The lily of the sands, also called sea lily, is a species living on the sand, or at least in a very aerated ground, hence its name, because it pululle near the coast. 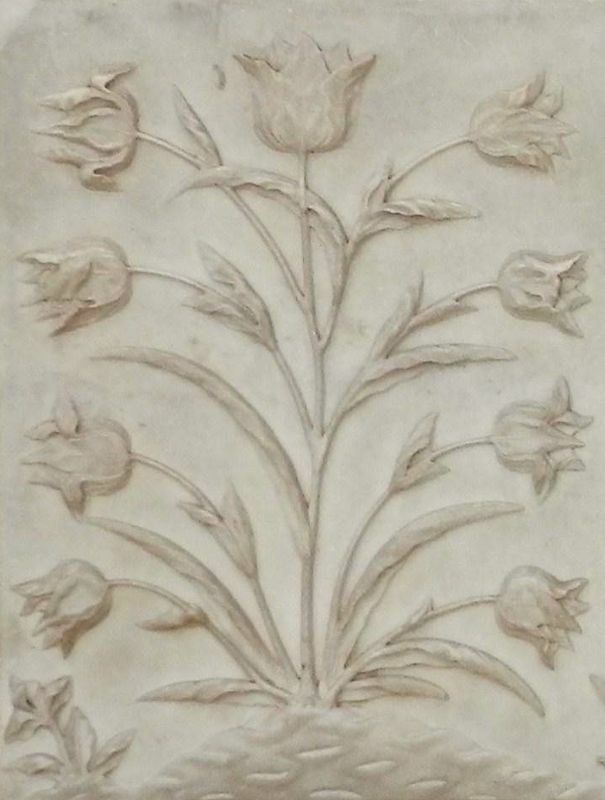 This is a Mediterranean plant whose presence on the Taj Mahal is very probably due to the fact that some artists came directly from Europe, especially from Italy (In addition, from Florence, high place of the art of pietra dura) However here, this plant is engraved in marble. 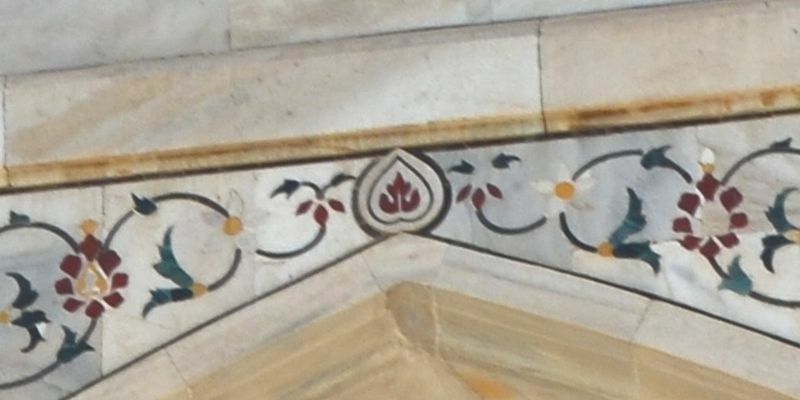 Flowers and leaves in pietra dura (mausoleum) and high relief in red sandstone (In the mosque). 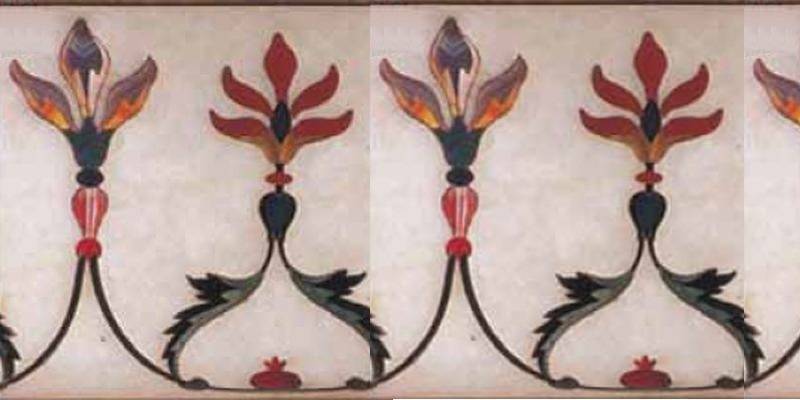 This Liliaceae is represented in several copies in the form of stone incrustation in marble, the so-called pietra dura technique. 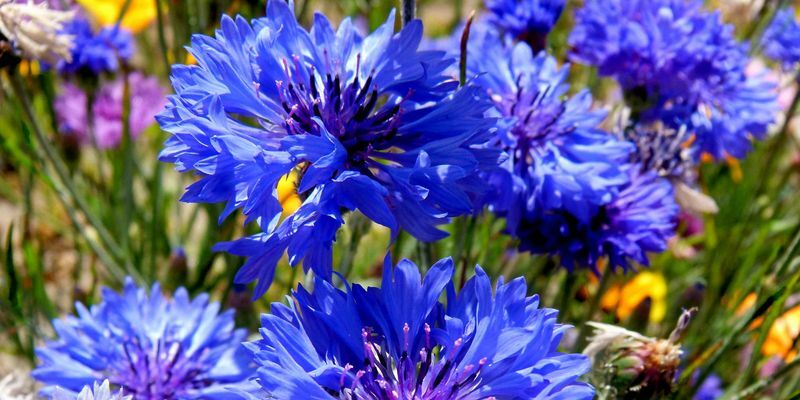 The representation is complete, from the root to the flowers, it also has leaves. It seems, however, that there are fewer flowers in the marble than a real stalk can carry. It is also represented in high relief in the sandstone of the mosque. The tulip is a common flower species that is associated with northern Europe. 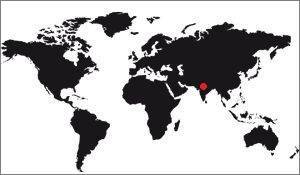 It was introduced to India from Europe precisely. 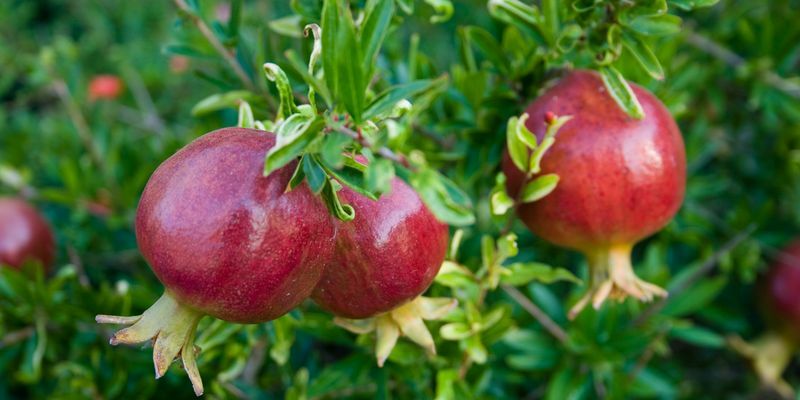 Its beauty is mainly due to its bright colors and its perfect roundness. 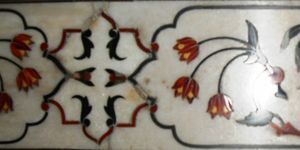 On the Taj Mahal, it is found engraved in the marble of the mausoleum, as shown in the picture above, and in pietra dura . Very original for us, the Taj Mahal has been engraved with ginger flowers, a plant with a conical flower that can be seen in the mosque. This representation is realistic. 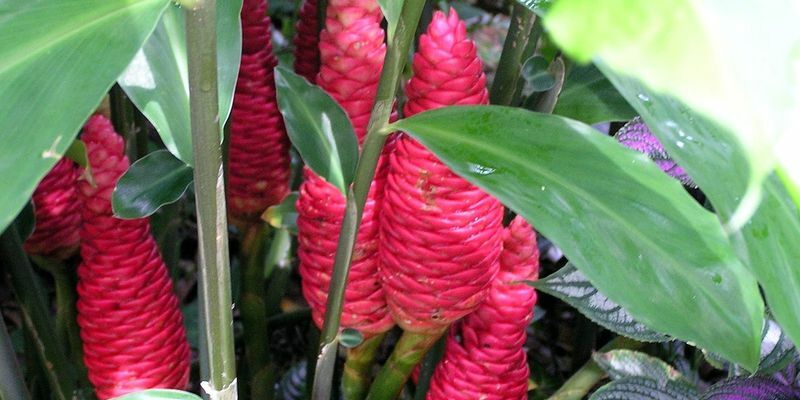 It must be said that ginger is an endemic plant in India, it was not imported. 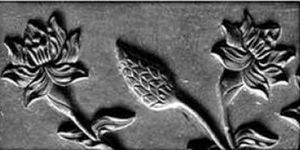 True Dicotyledons or Eudicotyledons are an important clade in the phylogenetic classifications of Angiosperms APG. 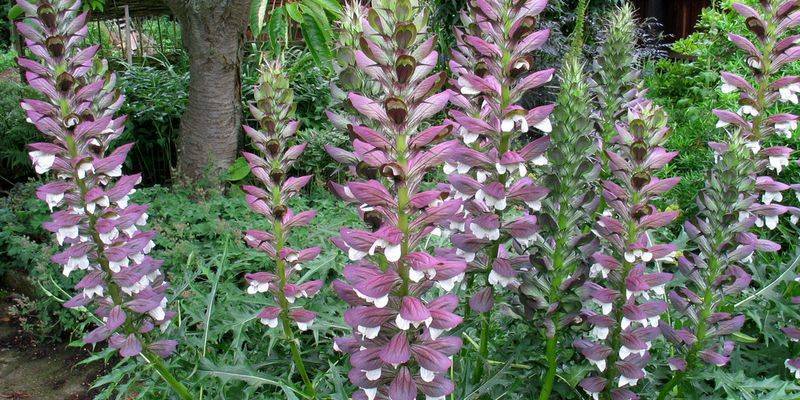 The acanthus is a long and tall flower, it is curiously a Mediterranean plant, but its presence on the Taj Mahal is explained by the large number of European artists who worked on the monument, there were many contacts between the Europe and India in the 17th century. 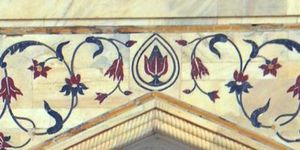 The acanthus is represented in high relief in marble (at the base and at the top of some small columns of the mausoleum), but also in pietra dura, on both sides of the top of the scene of secondary iwans. 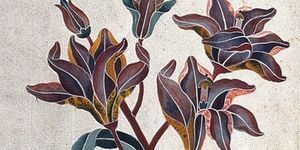 The river anemone is represented in pietra dura on the decorations of the main hall of the mausoleum, alternating with the orchid. 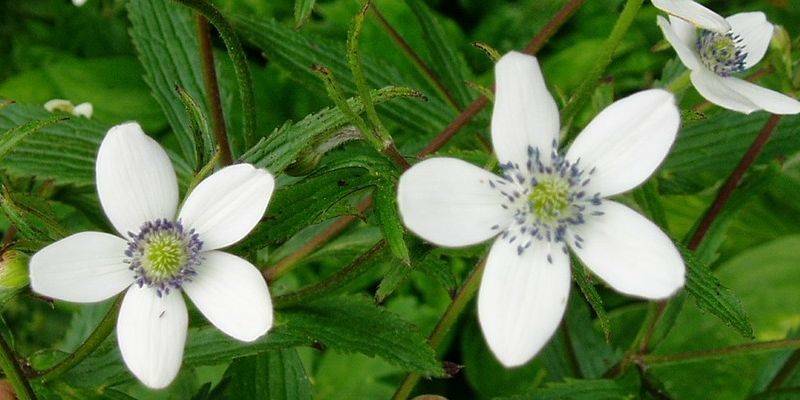 It is recognizable thanks to its multiple roots and its 5 petals, stylized. 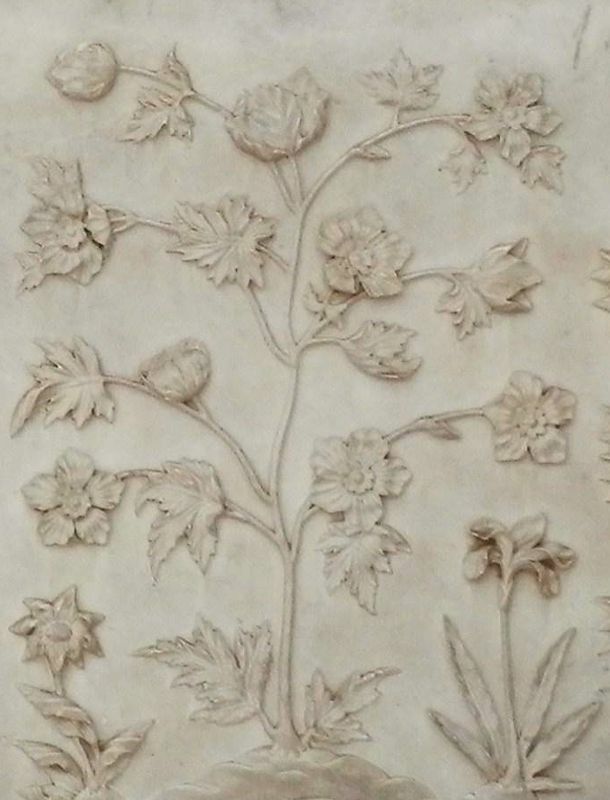 This plant is also found in the mausoleum in the form of a high relief. 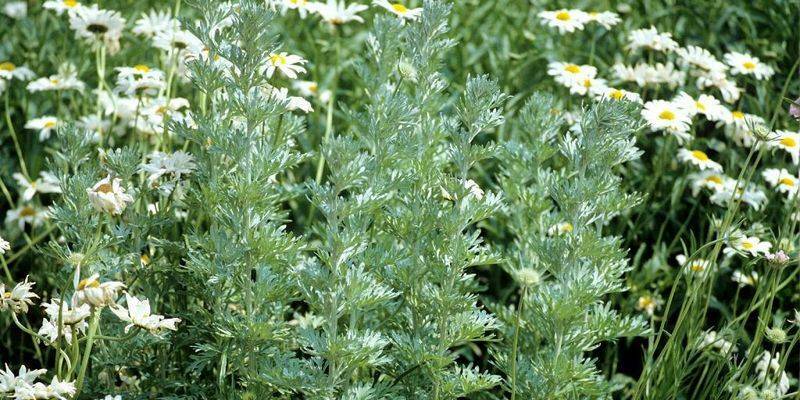 Absinthe is represented on the Taj Mahal through only its leaves, which have been mixed with another plant. 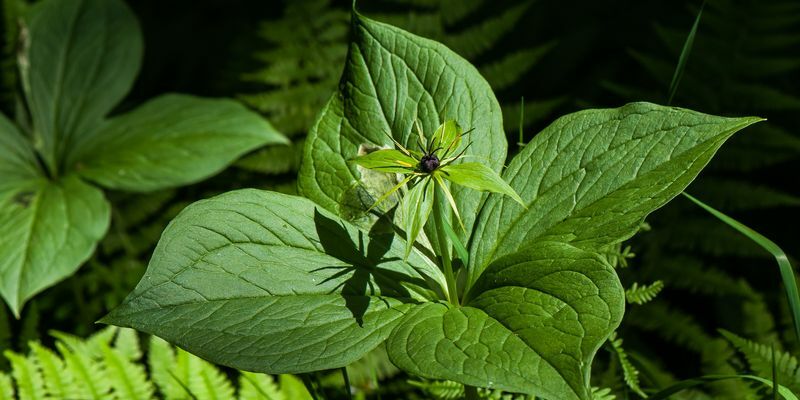 The photo here is an impossible species because it is a mixture of several plants. It is engraved in the marble of the mausoleum. This "Flame-of-the-forest" is aptly named, it seems to blaze in the Sun. It is a local plant represented a lot of times as a motif of repetition on the decorative friezes of the mausoleum. 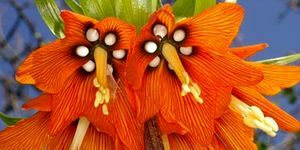 It is an orange flower whose characteristic is to have fine petals at their bases and very flared thereafter. 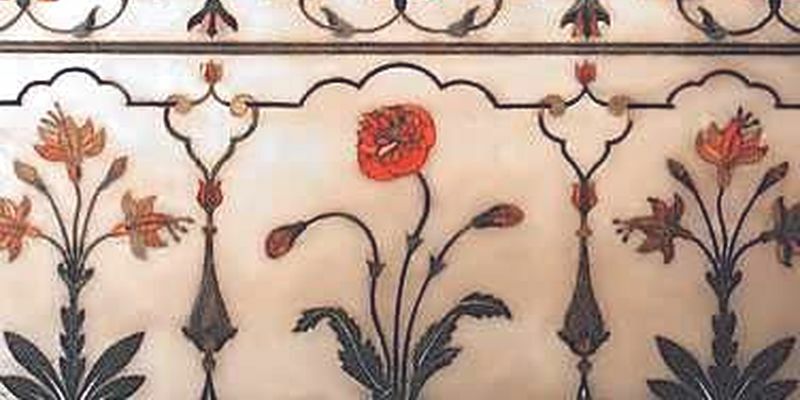 This relatively large flower, coming from Europe, is engraved several times in the marble of the mausoleum, on the lower part of the walls, but can also be seen in pietra dura in the mausoleum. 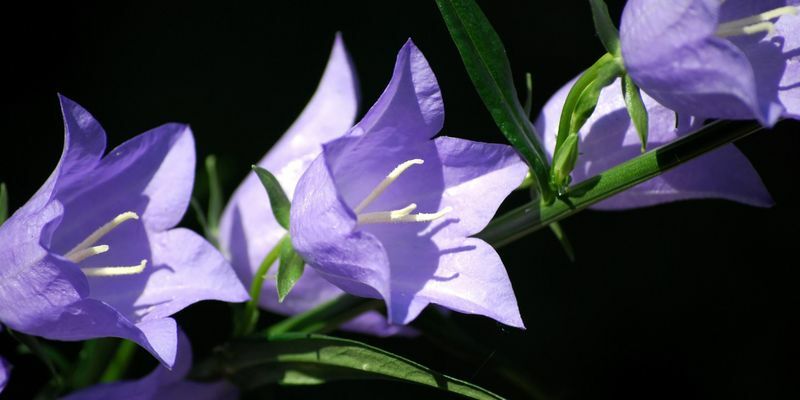 The campanula is a very pretty bell-shaped flower, like lily of the valley, but bigger. Moreover, the anglophones call it "Bellflower", the "flower-bell". 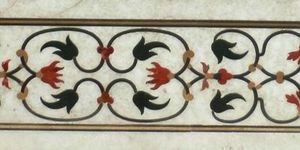 It is represented in pietra dura on the mausoleum, but there is no example here. 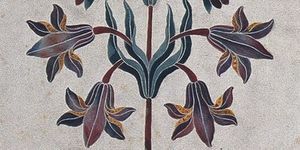 Introduced from Europe and Asia Minor, this flower of the Familly of Asteraceae is represented in pietra dura on the sets of iwans, these large porches on the facade of the mausoleum. They are exactly on the pediments of little iwans, the so-called "secondary Iwans". They are of course stylized, the technique of pietra dura not allowing to be very precise. 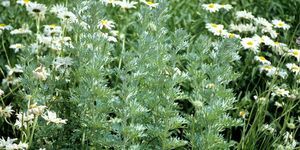 Chrysanthemum is very common in our regions, but it is also in India, even in the seventeenth century. 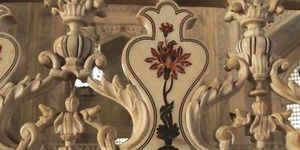 He was represented inside the mausoleum, on the balustrade surrounding the Cenotaphs of Shah Jahan and Mumtaz Mahal, for whom the monument was built. 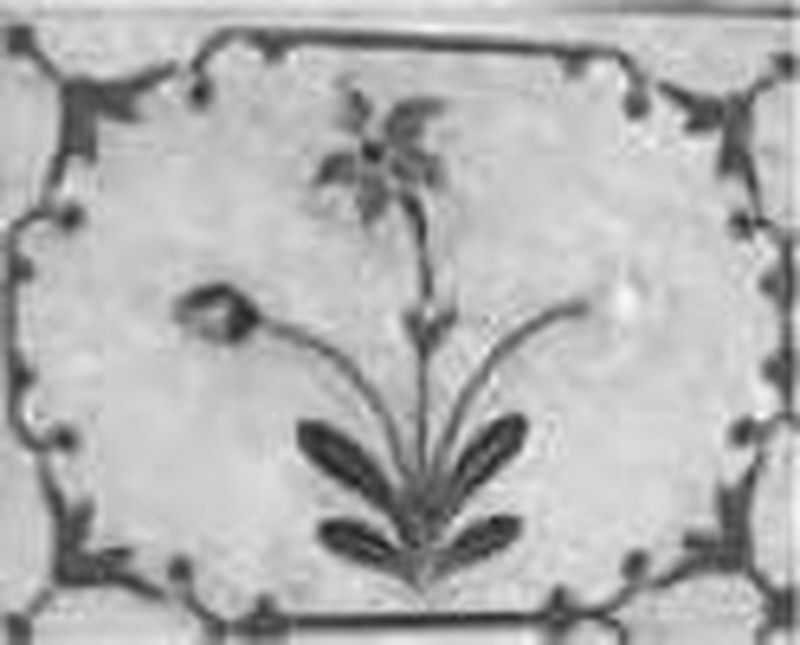 The technique is that of the pietra dura, the flower being surrounded by other smaller flowers, river anemones. The clematis is a flower imported from China in the seventeenth century, it was not unique to northern India. 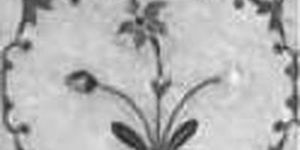 Apart from its simple beauty, it is its meaning that has justified its presence on the Taj Mahal, it has indeed 7 petals, whose meaning is indicated below. Here she is in pietra dura. 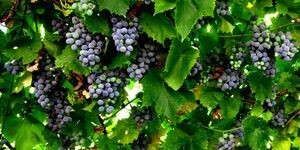 This plant is a kind of ivy called "Burma". Despite its name, it is a local plant in North India. In the mosque, she is pictured circling the cypress on the left side of the photo. It is drawn alternately, niche to niche, on the top of the walls. 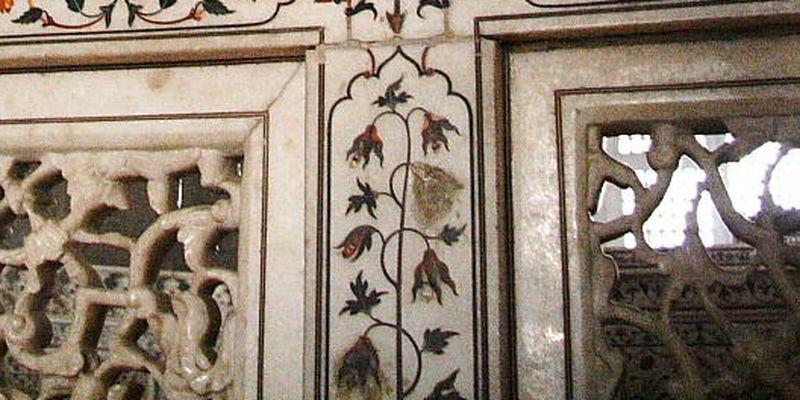 The delphinium is represented in high relief on the red sandstone walls of the mosque. 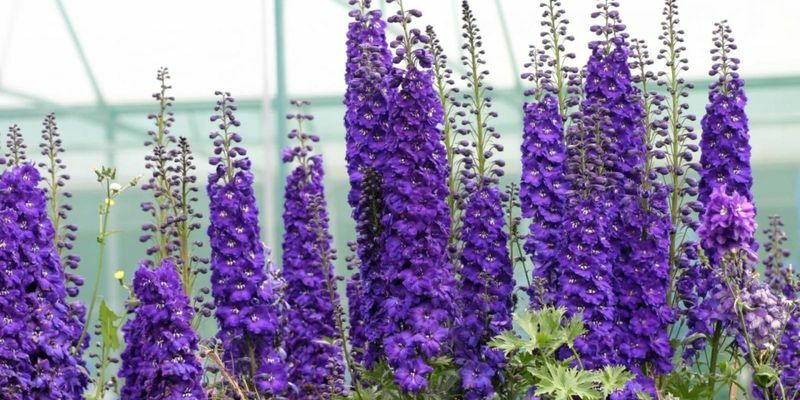 It is a plant with a conical flower, very original, a bit like lupine. Unfortunately, he has no picture of this flower here on the Taj Mahal. This flower seems rather banal, it is Familly of Caryophyllaceae. Its originality comes from the fact that it comes from Central Asia, it was unknown in northern India in the seventeenth century. 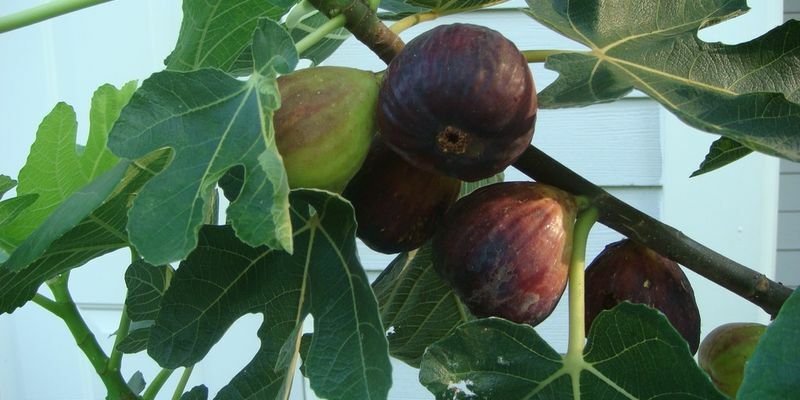 The fig tree is a fairly common tree around the Mediterranean. Here she was introduced to India from Turkey. 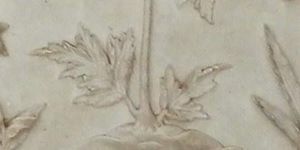 Its leaves, very characteristic, were represented in high relief in the marble of the mausoleum. 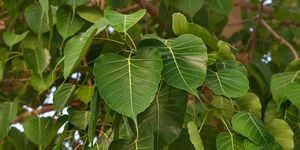 The Bodhi tree is a variety whose leaves have served as a model for the tour of the central motif, the pediment of the iwans (wide porch that is on the facades of the mausoleum). They are not represented directly but it is their forms that are used. They are in pietra dura of course, like all the decor of the iwans. 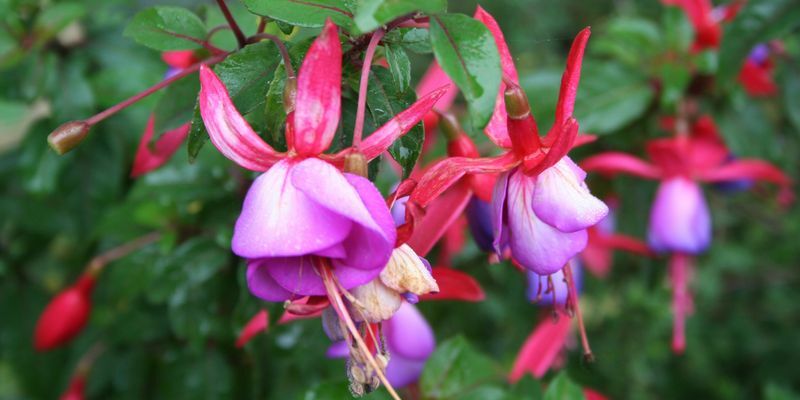 Fushia is a flower known for its bright pink color, but it is also very fine. 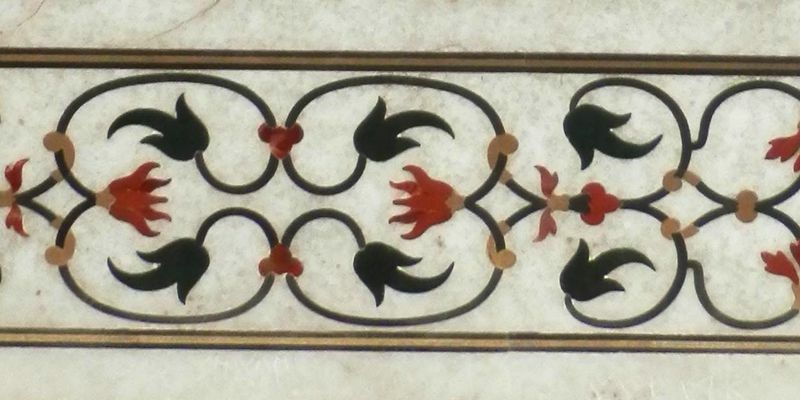 It is probably this characteristic that makes it represented in pietra dura on the mausoleum. 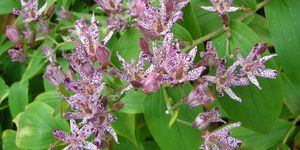 It should be known that it is a tropical plant but especially American. The Indians had frequent contact with the other continent in the seventeenth century, which explains the presence of this flower in the scenery of the Taj Mahal. Flower of the Familly of Oleaceae, jasmine is invariably associated with the Far East, but it is also a Local plant in India. She is represented several times on the mausoleum according to the technique of pietra dura. 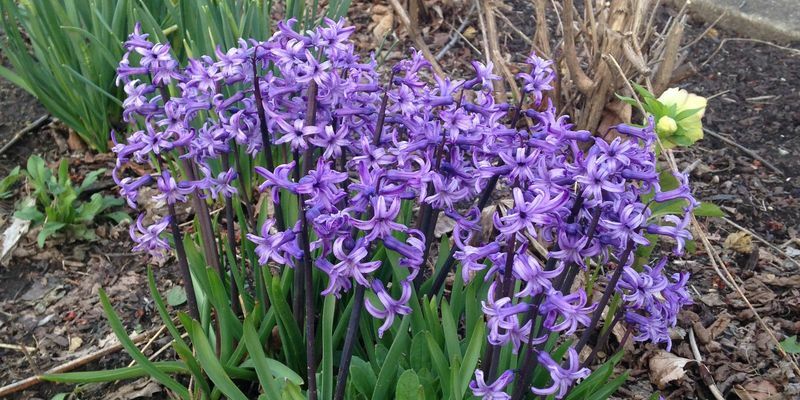 Introduced from China during the 17th century in India, this flower is reproduced very precisely on the poles that support the railing around the cenotaphs, in the center of the main hall of the mausoleum. It is characteristic enough to be easily recognized. 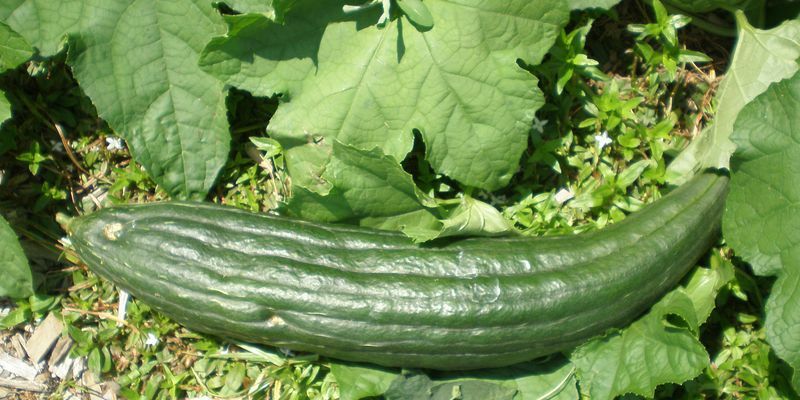 Here it is the flower of the cucumber, a large enough flower, which is represented. 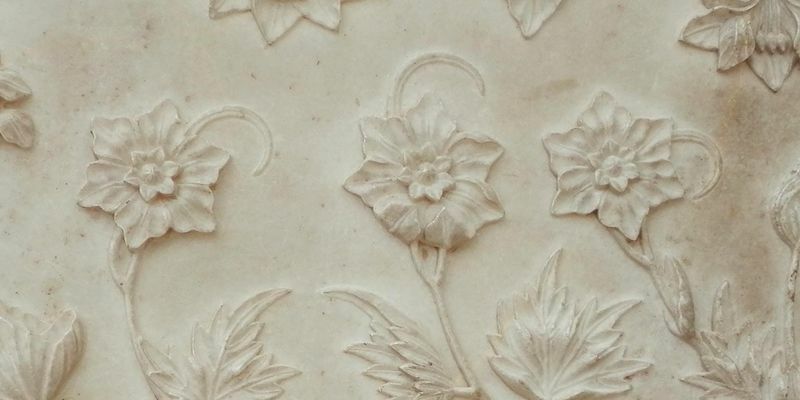 It is on a high relief of the mausoleum, carved in marble. Cucumber was introduced in India, it was not a local plant. The Indian lotus is, of course, a local plant. It is characterized by several rows of curved petals arranged concentrically. 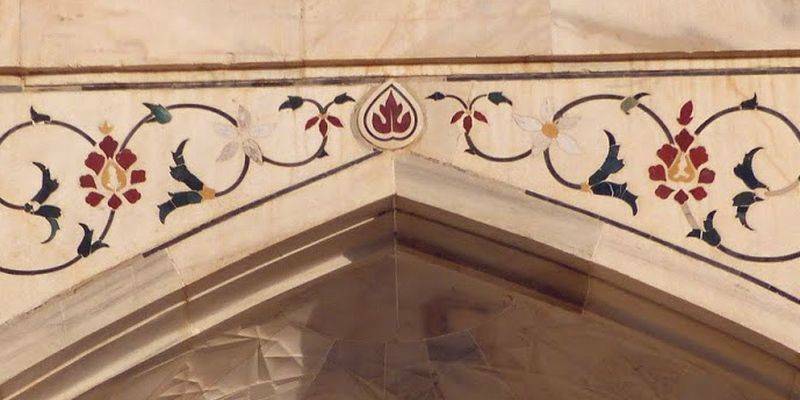 It is found in several places in the TajMahal, but it is at the top of the sets of iwans that it is most visible. 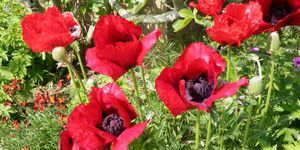 This flower is similar to the poppy, very fragile, like him. 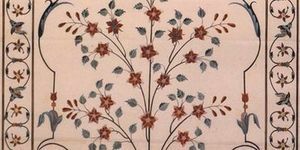 It is present in the form of the pietra dura for its flowers and in the form of engraving for its fruits. 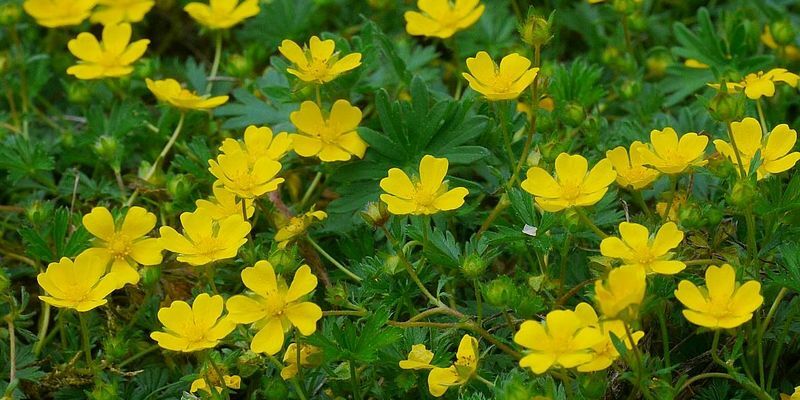 Potentilla cf. cuneata Wall. ex Lehm. Named Cinquefoil, this small 5-petal blossom is native to the north of the country, the Himalayas. She is represented in pietra dura on the mausoleum. 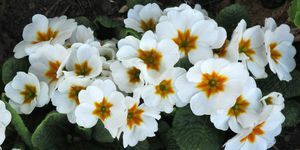 Primula cf. 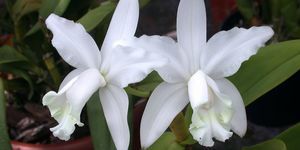 sinopurpurea Balf. f. ex Hutch. 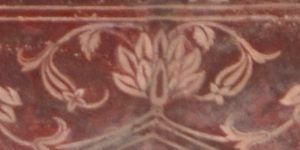 This plant is represented several times, alternating with another, on the mausoleum. It is rather original. It must be said that it comes from China. 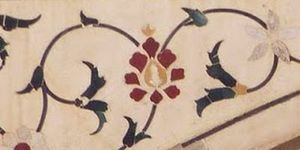 The pomegranate is better known for its fruits than for its flowers, both are however represented on the mausoleum, according to the technique of pietra dura. 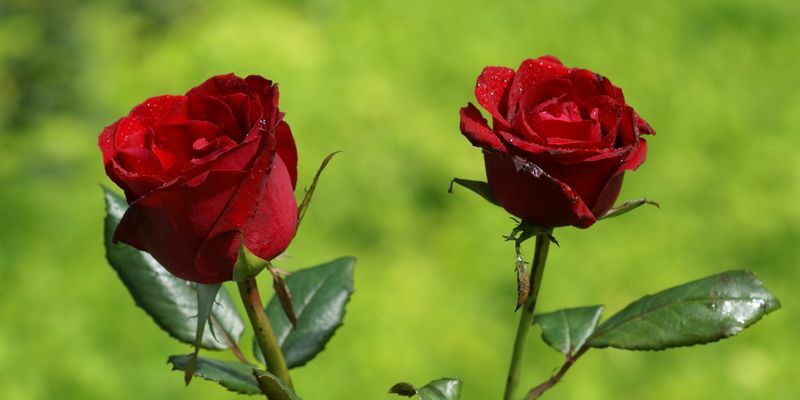 The rose is a European flower, it was probably imported to North India by artists coming to work on the Taj Mahal. She is represented many times in pietra dura. 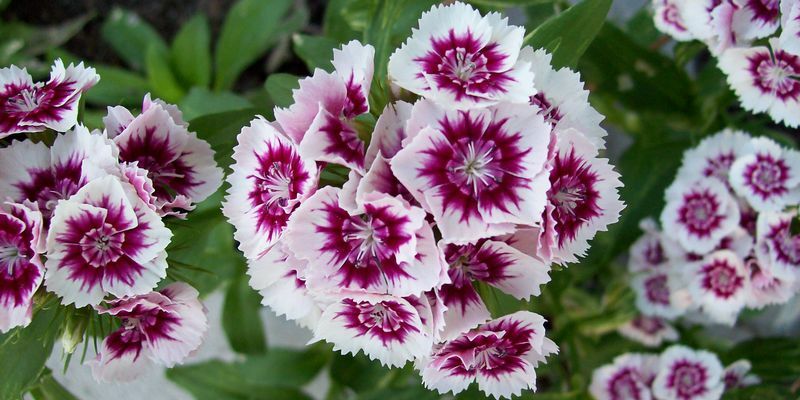 This flower is very original, it seems tortured, shredded. It is difficult to recognize on the Taj Mahal because it looks like leaves but it is flowers that are represented between the two large red flowers. They are on the sets of the pediments of the iwans among others. 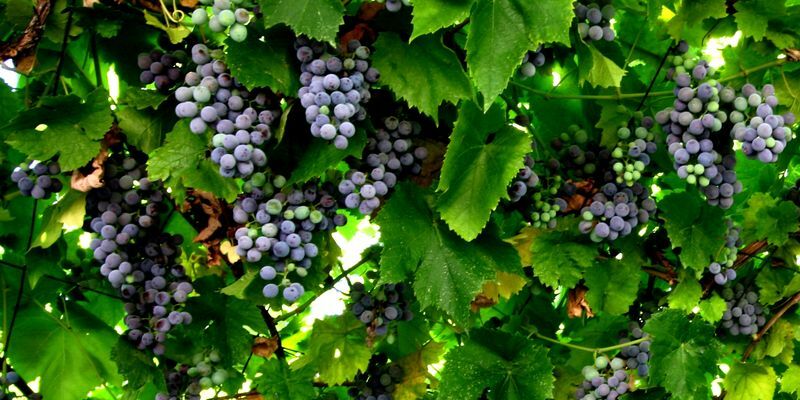 While the fruit is very original, are leaves of vines that have been used as decor. They are on marble panels engraved with plants. This plant is unknown, it probably does not exist because artists have not hesitated to invent their own plants, focusing more on the symbolic representation of the plant than on its physical reality. 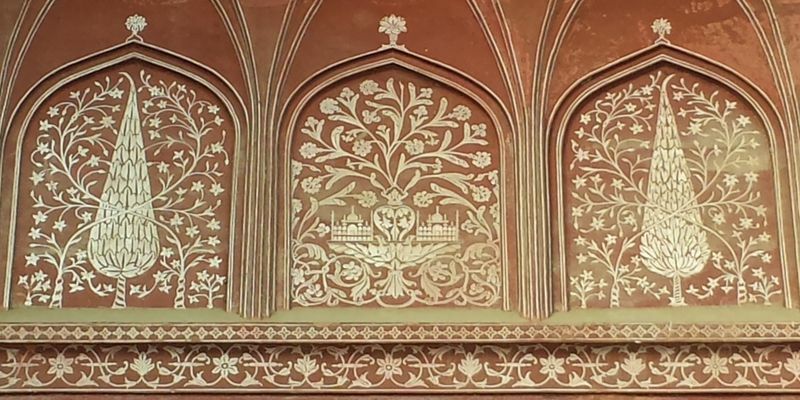 It can be seen engraved in the red sandstone of the mosque. The Taj Mahal also has flower sculptures following geometric designs, they are very rare in the complex but they exist beautiful is well. There are also geometric figures representing silhouettes of trees. Technically, these figures are in pietra dura or engraved in the marble of the mausoleum, but it is also found in the red sandstone of the mosque. 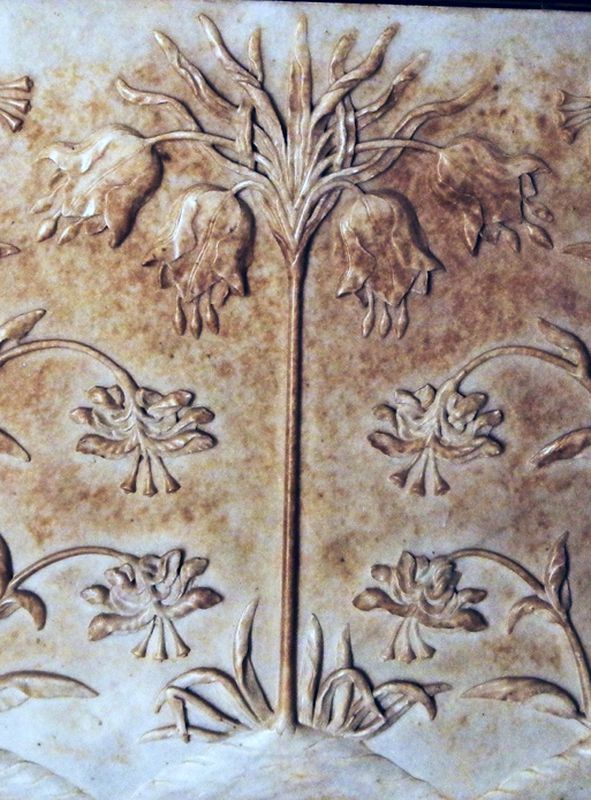 The silhouettes of trees are rather in bas-relief, but there are still some in pietra dura. 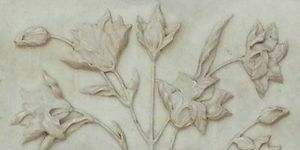 On several panels of marble and red sandstone the visitor can see different leaves, which accompanied the different flowers. However, many of these leaves did not match with the flowers. For example, Eudicotyledon leaves are found in flowering monocotyledonous branches. For this reason, the plant can not be considered correct or has a correct taxonomic significance. 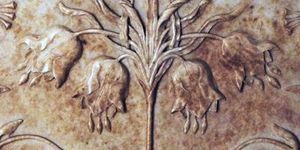 The iconographic technique is that of high relief on marble, but also on the will of the mosque. The basic morphological figure is figurative, sometimes Naturalist, sometimes idealized. 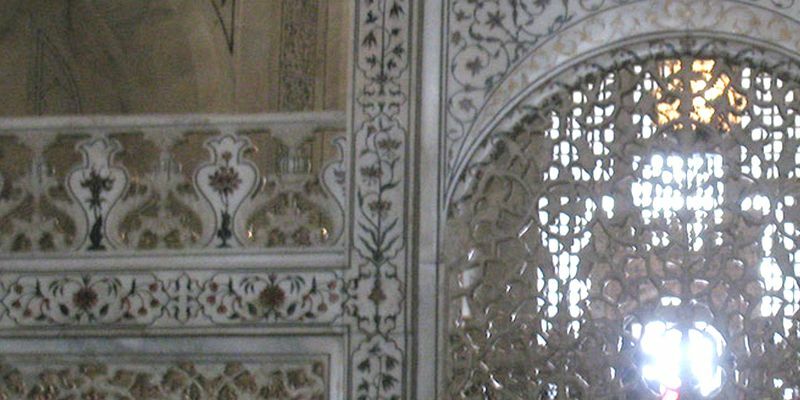 Based on previous studies, the vegetal iconography of the Taj Mahal complex is contained in its totality - if we trust Sondereguer (2004) in two primary styles, figurative (natural or idealized) and abstraction (figurative or geometric). However, the naturalistic figurative style is the most common because of the 46 species identified, 31 are of this style. 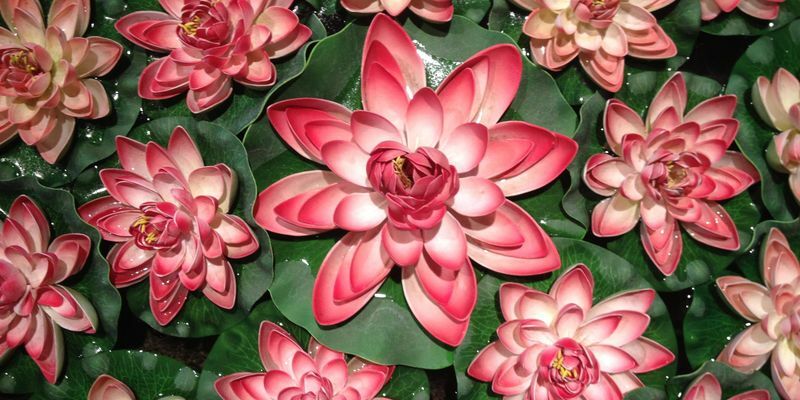 The representation of the lotus (Nelumbo nucifera, the national flower of India) is also recurrent on the Taj Mahal, it is compatible with the meaning of birth, purity, beauty, spirituality and eternity in many cultures and religions (Patnaik 1993, Gupta 1996, Misbach 2003, O'Connell and Airey 2007, Spellman 2008). In India, there is also a sexual mythology around the lotus flower because it symbolizes the different aspects of female sexuality, which depends on age. (Frownfelter, 2010). 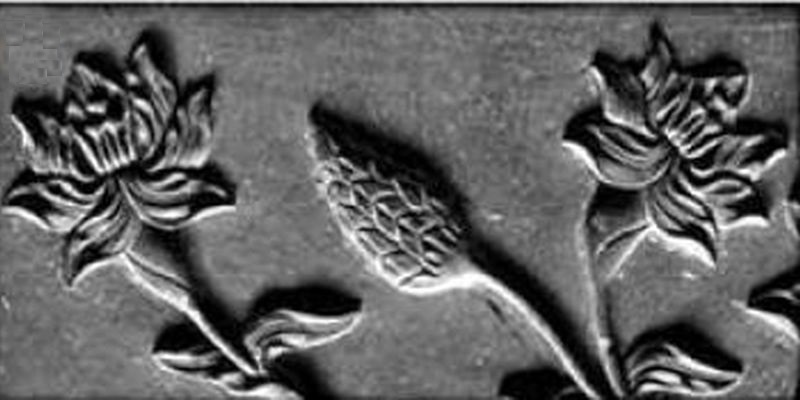 Thus, the lotus may be a symbol of the "fertile belly", its pistil is the fetus, its buds represent the "virgin cunnus" and when the lotus is in full bloom it represents the birth of a baby (Frownfelter, 2010 ). 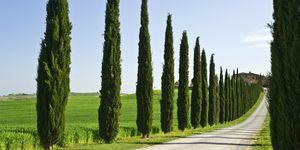 Examination of Cupressus sempervirens in iconography reveals that it is associated with a symbolism inherent in death, hence its English name "funeral cypress". 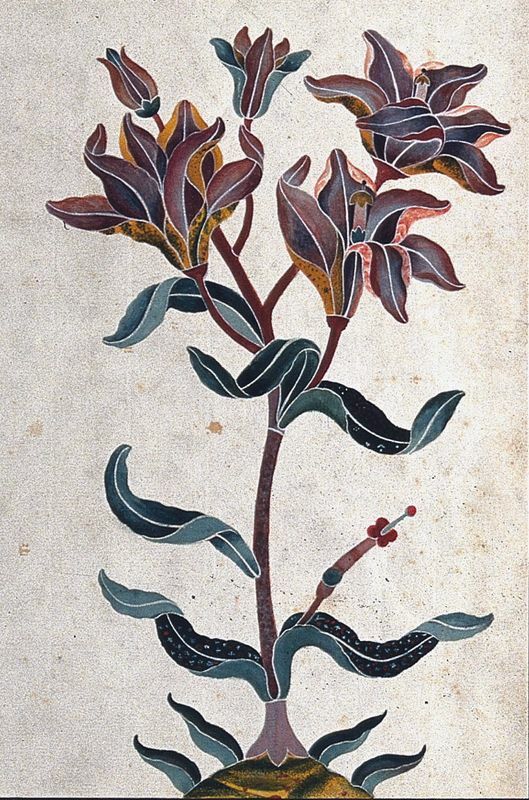 Such plants are frequent, not only as a recurring element in Mughal iconography, but also as an element used in Persian and Ottoman gardens. This species in Asia is also a symbol of longevity and strength (O'Connell and Airey, 2007). 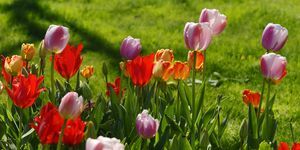 Meanwhile, in ancient Persia, tulips (Tulipa spp) were symbols of perfect love, whose flowers are found in the gardens of Paradise (O'Connell and Airey, 2007). 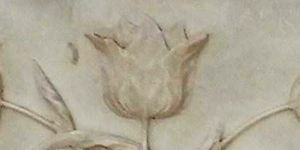 During the Ottoman period, the tulip became a symbol of divinity and became the emblem of Ottoman rulers (O'Connell and Airey, 2007). According to them, the Quran says that pomegranates (Punica granatum) are part of the gifts of God, and these fruits are associated with fertility, unity, love, marriage and even death. 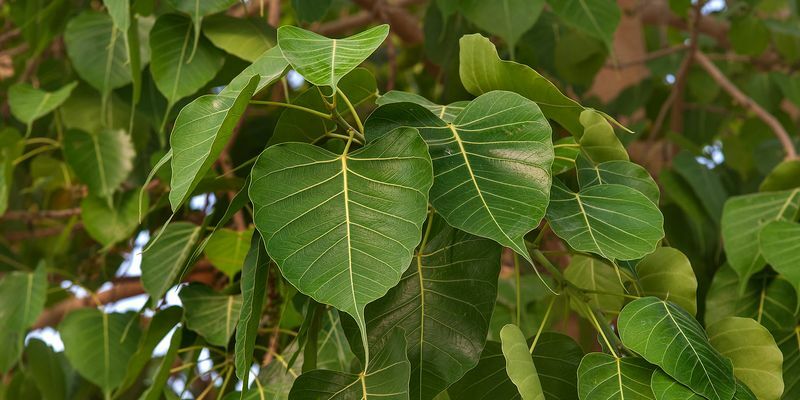 Similarly, the Ficus carica is a symbol of fertility and immortal moral teaching while the Ficus represents creation, life and preparation for paradise. 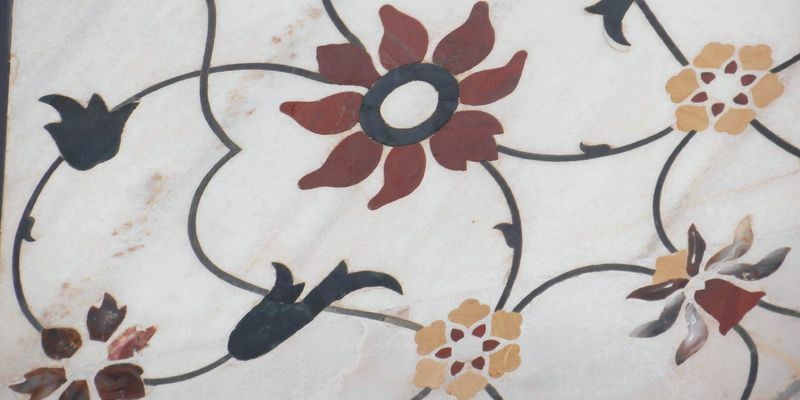 Most of the species used in Taj Mahal iconography are mainly symbolic rather than religious. Thus, the tetrameric flowers symbolize the four directions of space (north, south, east and west); the center of the flower represents the supreme God, who also controls the four directions of space. 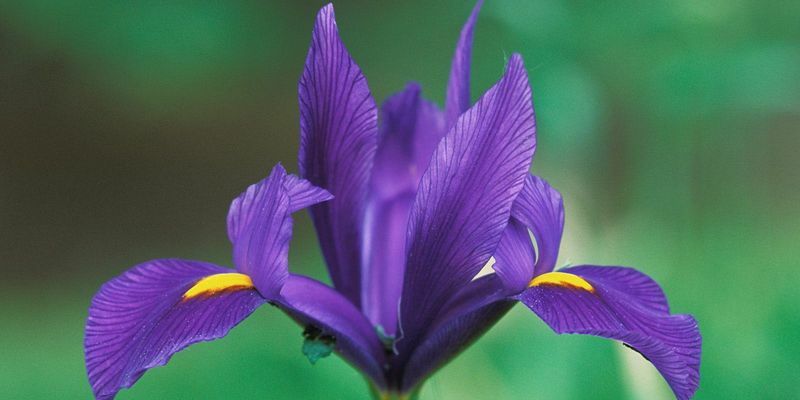 In addition, the four petals represent the four stages of life (childhood, adolescence, adulthood and old age). 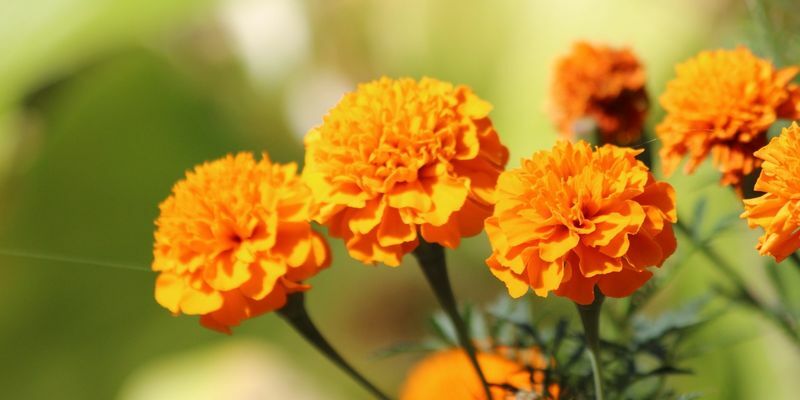 The pentameric flowers (5 petals) symbolize the five senses (sight, smell, touch, taste and hearing) and the five basic elements (fire, air, earth, water). and the wind). Meanwhile, Hexameric flowers represent the six directions of space (north, south, east, west, up and down) and the six attributes of the Supreme Lord (judgment, strength, glory, compassion, wealth, and the divine forces) (Gupta, 1996). For a complete interpretation of the plants in the Mughal culture, one must read the study of Misbach (2003), very complete on this subject. 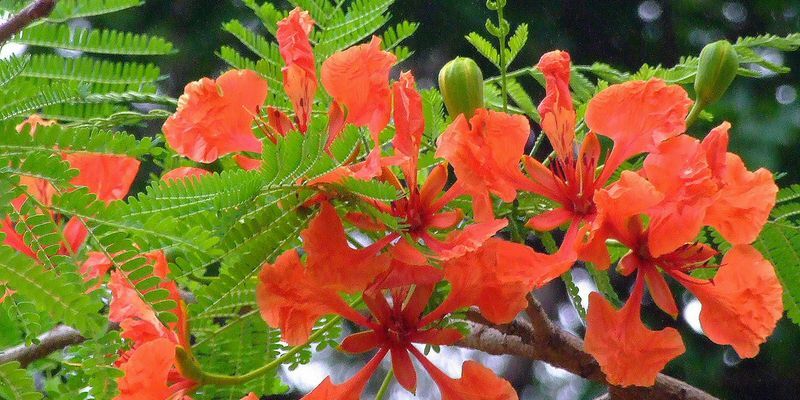 The use of plant species that are not in the geographical area of ​​India, and which are largely from Central Asia, is justified by the interest of the Mughals in the world's flora. Islamic, which had already been highlighted by Wescoat Jr. (1999), Kossak and Watts (2001), Misbach (2003) and Michell (2007) for other Mughal buildings in India. 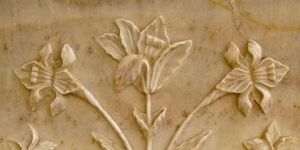 In the iconography of the Taj Mahal complex there are also species from Europe and the Mediterranean, which would demonstrate the influence of the Europeans who participated in its construction, who were able to even introduce on the mausoleum of species that were usual to them. (See Havell, 1920) Other exogenous plants meet, highlighted by Gupta (1996) in his study of Buddhist, Hindu and Jain temples. 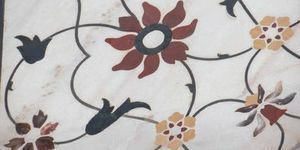 Similarly, it is necessary to highlight the use of a species of tropical America in the iconography of the Taj Mahal (see Fuchsia venusta), a totally credible situation because, since ancient times, more or less before the year 1500 (Martinez, 1988, Gupta, 1996) and even before (Gupta 1996, Gupta 1996, Kossak and Watts Menzies, 2006), many American plants circulated to Asia (Martinez, 1988). that peppers or peppers (Martinez, 1988, 2001), acapulcos, pumpkins, cascadines or divis, hawthorns, guachimoles or tamarind shackles, brichos or Mezquitillos, beans, guava, prosopis, potatoes, round pepper (Martinez , 1988), sweet potato, sunflower, maraco, cashew (Gupta, 1996), corn (Martinez, 1988, Johannessen and Parker, 1989, Gupta, 1996, Menzies, 2006), pineapples (Martinez, 1988, Gupta). , 1996), snuff (Michell, 2007). 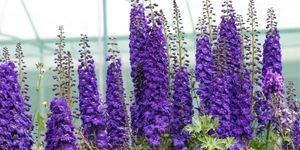 This list is not exhaustive, as there was also circulation of ornamental plants introduced in the Americas in Asia. According to Gupta (1996), most of the introduced plants in India were taken by the Portuguese in the 16th century. 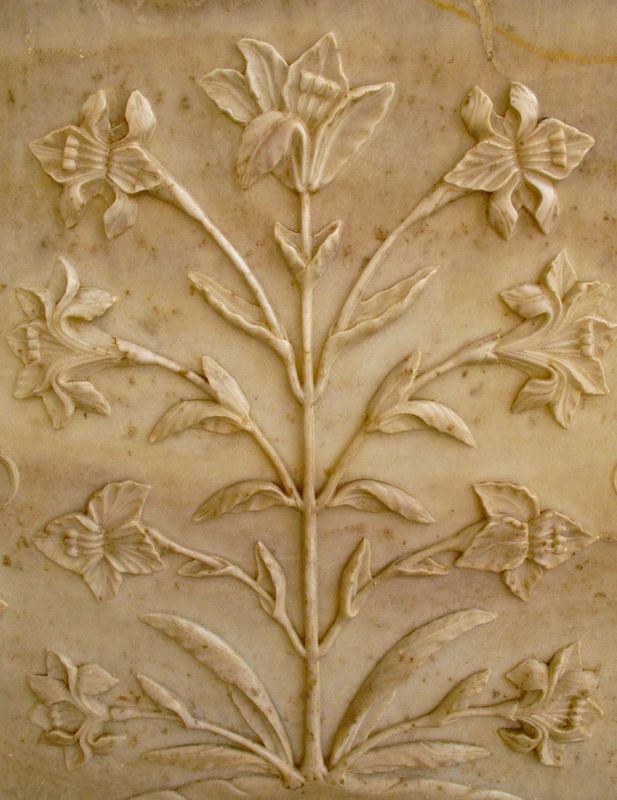 Another interesting fact is the use of flora in the iconography of the Taj Mahal as a subject of the image, contrary to Western iconography and that of the Ottoman period, where flora and nature in general fits in a scene without being the main subject, it is only an accompaniment of a landscape or characters, whether a king, a noble, a saint, a virgin, an angel or a christ (see and 1978, Leal del Castillo 2001, O'Connell and Airey 2007). 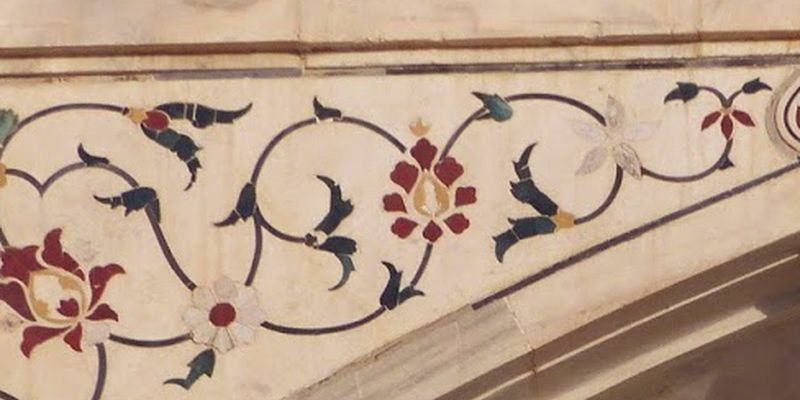 It is also important to note the absence of faunistic motifs in the Taj Mahal iconography, which may be abundant in other types of ancient buildings in India, for example the Karni Mata temple in Rajasthan - it corresponds to the Mughal style late - in which marble reliefs frequently associate plants and animals (Giraldo-Cañas, 2013). The same situation arises in several Mughal buildings, not only in India but also in Pakistan (Misbach, 2003). Finally, it is curious to note the under-representation of tree species (eg Butea of ​​monosperms, Cupressus sempervirens, Ficus carica, religious ficus and pomegranate) as well as fruits and other infructescences (eg Luffa cylindrica, Magnolia sp., Oriental papaver and pomegranate) in the iconography of the Taj Mahal complex. There is a significant difference with the species used in Mughal iconography, since most of the species correspond to landscaping and beautification elements, in contrast to the old iconographic style in which most species used are food or magic (religious) use, as in Bolivia, Colombia, Ecuador, Guatemala, Mexico and Peru. When Emperor Shah Jahan gave the order to build the Taj Mahal, the latter wanted the most beautiful possible. For the incrustations of stone he wanted only precious and semi-precious stones, and that's how the building was made. The Taj Mahal shone brightly for two centuries, with most of these riches still hanging on its walls. The stones came from different horizons. Jasper is undoubtedly one of the most banal, it only served to bring a red color. Jasper is a sedimentary stone with a high silica content, sometimes containing clay. She came from Punjab, a region in northwestern India, close to Delhi. Jade is a semi-precious stone of green color. It can take different shades and has the characteristic of being very hard. The one found at Taj Mahal was imported from China. China is also the region of origin of the crystal, a member of the glass industry whose particularity is to be very pure, while containing a large amount of lead. The blue inlays come from the Tibet region, they are turquoises, also semi-precious stones. A turquoise is simply a hydrated phosphate stone of copper and aluminum, which gives it that hue. Nowadays most of the turquoise veins of the planet are exhausted. Always in the blues we find lapis lazulis to make deep blue. This stone contains silicate, it is he who gives it this color. Lapi lazuli comes from Sri Lanka, just like sapphires, the first precious stone on this list. The sapphire is a deep blue very particular. Finally the Taj Mahal contained real white diamonds, they came from Panna, in Rajasthan. 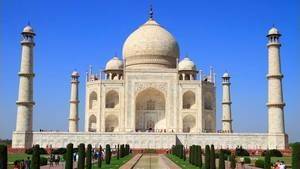 This list is of course not exhaustive, the Taj Mahal does not include less than 28 kinds of precious stones, precious or semi-precious to do the work of incrustation. 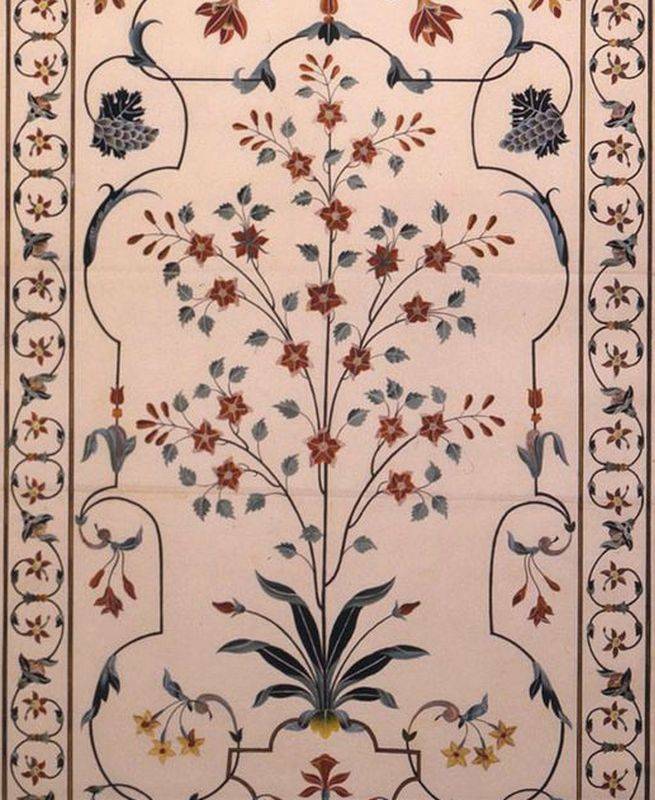 The pietra dura is a technique of lapidary marquetry for decoration. It is neither more nor less than a puzzle of great precision whose pieces are cut stone and the support is a marble plate dug. The artist who works begins by making a sketch of what he must represent, then he makes a complete drawing, color to support. This drawing is necessarily in several pieces of different color, it's up to him to choose the right stones. Then he works on the support, which is a marble slab that he abrades until he gets a support of the right perfectly flat dimension. The next part is to cut the stones, a meticulous work requiring precision and time. Each stone must have a shape of its own, and have the necessary size. Finally we must take care of the support. By combining all the stones according to the sketch, the artist draws - by engraving - the shapes that he must dig on his marble slab so that the stones fit perfectly into the future holes. It remains to make these holes exactly the right size. It is often another worker who does this, each of whom is destined for a different job on such a site. When the holes are made we put the stones and we have more than polish the set so that there are salient angles, the work is finished. 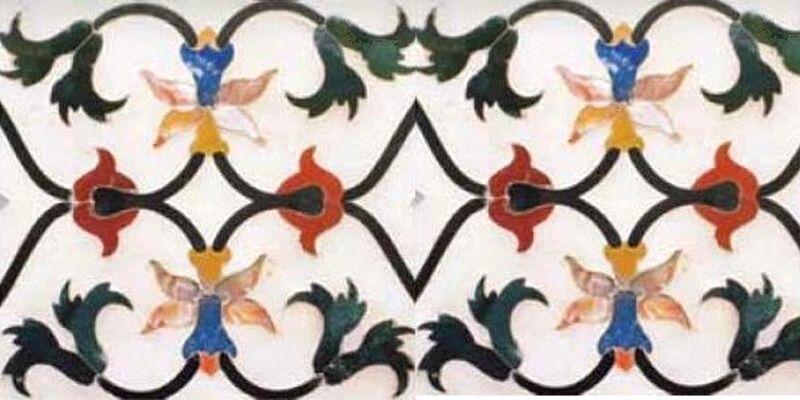 This is called the technique of pietra dura, which was a specialty of the city of Florence during the seventeenth century. Emperor Shah Jahan, when he wished there were stone incrustations in the Taj Mahal, brought Italian workers to take care of the incrustations. 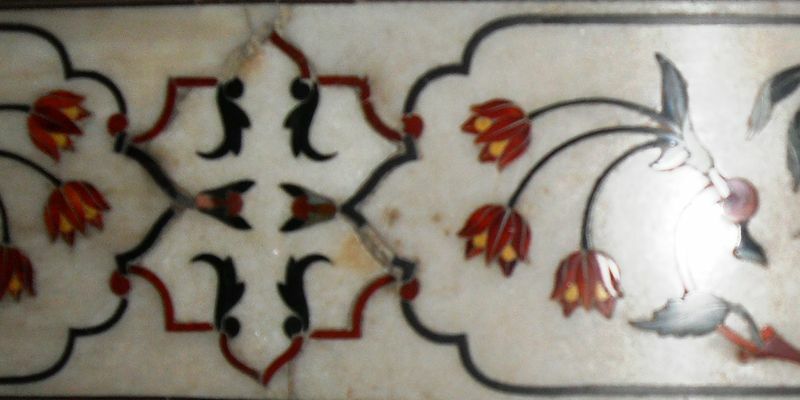 The mausoleum of the Taj Mahal is very largely decorated with floral motifs, mostly engraved in marble or in pietra dura, a technique of stone marquetry. But we can not miss the splendid inscriptions in Arabic seems it, inscriptions that run all around iwans (these large, traditional porches of Persian architecture). 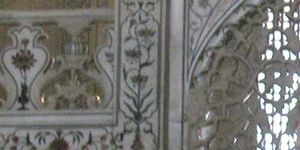 There are also on the portal of entry gardens, and on the cenotaphs of Shah Jahan and his wife for whom the monument was built, Mumtaz Mahal. 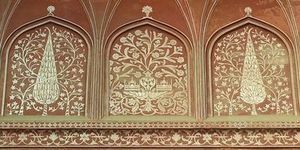 These inscriptions have of course a specific meaning to read on the page devoted to Calligraphic inscriptions of the Taj Mahal.